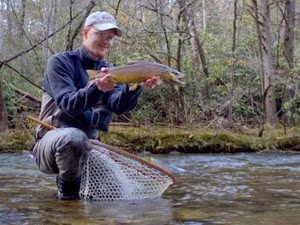 So far this year, I have seen numerous 20"+ fish come to the net on guided float and wade trips. Lots of happy smiling anglers have had their pictures taken with that fish of a lifetime or at least their fish of the year. 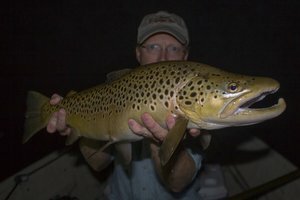 The Double of the Year will probably not be surpassed, but the brown trout caught then has now been surpassed as guide trip fish of the year. The story goes back a little while when my aunt contacted me about gifting her coworker with a guided float trip. We discussed the details and set up a trip for Sherian who used to fly fish a lot and has not had the time for the last few years. Eventually the day of the trip came around and Sherian and I had a great float down the river. 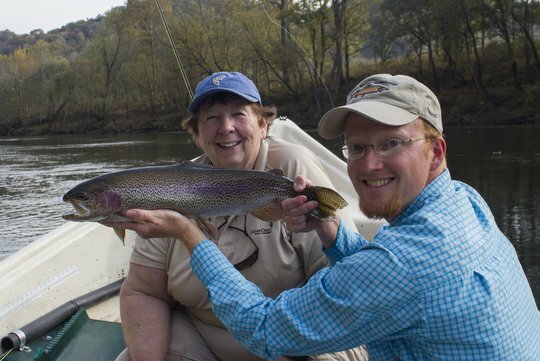 She hooked two big rainbows and landed one of them along with all of the other usual fish between 10 and 17 inches. We finished the day discussions a possible return the following week. Thankfully I still had the following Wednesday free on the calendar and more plans were made. Fast forward a week and she was back for another afternoon on the river. That morning, before heading out, inspiration struck, and a new pattern came out of the vise. I was wondering how it would fish. Turns out it was quite a fly. Fished tandem with a Zebra Midge, the better trout were showing a preference for the new pattern while the small to medium sized fish wanted the usual midge. We were drifting the better sections looking for big trout. Lately the big fish have been coming higher up in the float, but when we didn't hit the jackpot early, we kept looking. Finally we were approaching a section where I've seen two big rainbows lately. I directed Sherian to cast to the left of the boat and set up her drift. Sure enough, right as the flies hit the drop-off at the back of the shoal the indicator shot under. When she set the hook I knew we had a good one. I got the anchor down quickly while the boat was still in semi-shallow water. Then I grabbed the net and jumped overboard to make sure we got the fish in the net. Turns out the semi-shallow water was close to waist deep and shockingly refreshing for someone wearing sandals instead of waders. The effort was worth it though. When the big rainbow trout hit the net, my first estimate of 20" had to be revised upward. When the fish hit the tape, it was 23" almost on the nose and the largest fish caught on a guide trip this year so far. We spent a considerable amount of time discussing whether the angler or guide was happier, but the consensus was definitely that we were all thrilled with such a great fish. Having an angler in the front of the boat who could cast with great accuracy certainly helped nail this trout, but I've had even first time anglers break 20" this year on float trips. This has truly been a year to remember and it looks like that will continue for the foreseeable future. The good news for everyone else? 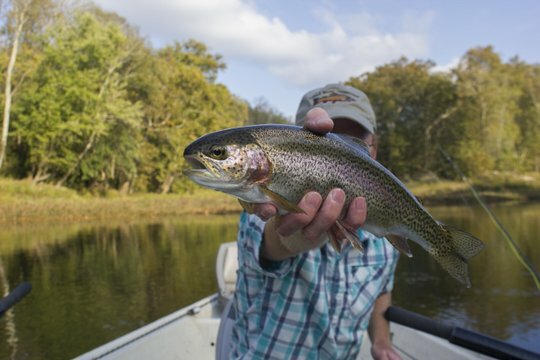 There are still two months left in the year and as well as the fishing has been, there is still time to get your guided float trip lined up. I have some openings throughout November and December so contact me to get your spot on the boat guaranteed before it is too late. Who knows, you may even get the new largest "Big Fish of the Year." Everything was already rigged and ready to go from the previous day's guide trip which had been epic enough to motivate me to float on my own. I was about to continue a current trend I've been experiencing: banner days with clients and slow days on my own. To be fair, I usually experiment at least half of the time when I'm fishing on my own. After all, that is how I dial in new patterns and continue the endless innovation required to keep putting people on big tailwater trout. 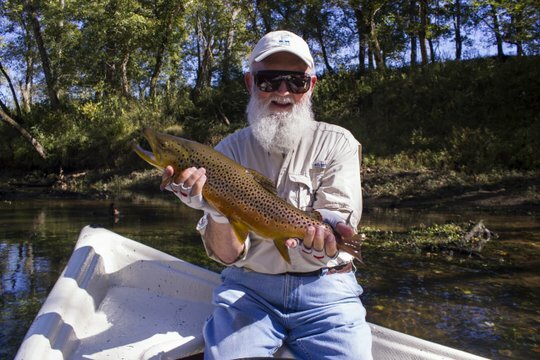 There is no substitute for testing flies on real live trout. In other words, I have to go fishing so I can be successful at my job. I know, life is tough. This trip began smoothly and before long I was cruising down the river, being tossed to and fro with the strong winds. That wasn't in the bargain. The weather reports lately have been terribly optimistic when it comes to wind. A standard forecast has been "partly cloudy with calm winds." When it claims that winds will be light up to 5 miles per hour, I know I'll be fighting the wind all day long. Either forecast usually results in variable winds with gusts up to 20 miles per hour. Go figure. Variable meaning they vary in intensity and direction. The winds come from all points of the compass. So, fishing by myself was possible if the calm winds forecasted materialized. As it turned out, I had to anchor up to fish some parts of the river. There was simply no way to track straight without constantly working the oars which made it difficult to also work the fly rod. Thankfully, in some sections the wind would magically die down for anywhere from 30 seconds to sometimes 15 or 20 minutes. Those were the easy times, were my drifts were perfect and long, and the indicator dipped just often enough to keep me interested. One section gets hit by every boat coming down the river, so I realized I needed to fish it differently. That meant choosing a line that was not the same as other boats. This was one of the calm sections so I could managed to fish effectively without fighting the boat. A long drift was in the process of becoming longer when the indicator shot down. The fight literally took me all over the river, and I almost lost the fish due to some submerged structure, but eventually a beautiful holdover rainbow graced my net. I was all set up to take pictures quickly without stressing the fish and tried it out for the first time on this fish. Turned out well I think! The float would continue about the same. Lots of wind, a few fish, lots of relaxation. Late in the day, I hit a shoal that has been fishing well and anchored up for some of the best action of the trip. Back to back to back to...well, you get the point. 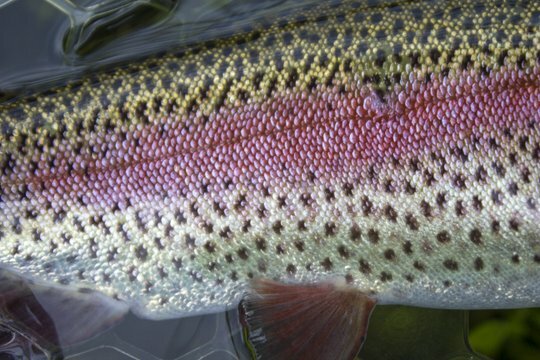 Several casts in a row produced fish, and although none were large, I was happy to enjoy these beautiful rainbow and brown trout. This was the first truly good consistent action of the day so I probably stayed out longer than I should have. I never did find any of the big fish I was hoping to catch. That is the funny thing. I've had a lot of great days lately with clients still catching several big fish, but more often than not I'm only catching normal fish whatever that means. The big brown trout have eluded me since that bruiser back in August. I've been having a great time though regardless of whether I've been catching big trout. My clients have and that is the important part. I enjoy watching others catch big fish at least as much as I enjoy catching them myself. Want to see some of these big fish? Check out my Instagram and Facebook Accounts (search for Trout Zone Anglers). This summer has been a bit of an anomaly for me for several reasons. You may have noticed that I've been light on the blogging for several months now. The problem is one of inspiration or the lack thereof. 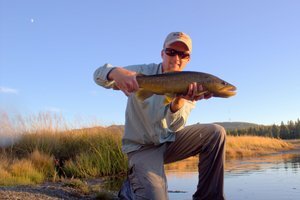 As a fly fishing guide, I help a lot of people catch fish but have not been fishing as much for myself. When I started guiding, the one thing I wanted to avoid was to turn this into strictly a fishing report for my guide trips. 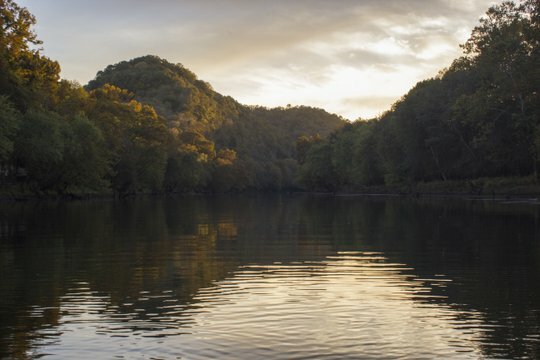 Yes, a few trips have been featured on here, and to be quite honest, I've been excited about so many of them that a lot could make their way on here, but I'm not blogging to drum up business (as easy as that might be as well as the Caney Fork has been fishing). If you want to see my exploits on the guide front, check out my Trout Zone Anglers Instagram or Facebook accounts and you will find lots of pictures of happy anglers holding big trout. All of this guiding has been good, but I've not spent as much time on the water for myself, and on the occasions that I do find myself out fishing, I just haven't taken many fish pictures save for a few occasional beasts that just begged for a photo. When I get to the bottom of the problem, it really just comes down to pure laziness on my part along with the shortage of suitable blog post stories and material. So, when I headed for the river this past Thursday afternoon for 2-3 hours of fishing, I was excited to be getting away on my own. The conditions were unusual compared to what was normal over the summer. Cool and cloudy weather made spotting fish a little tough, but I was happy to not be roasting on the stream for a change. The clouds were even threatening a little rain but more on that later. I was intent on fishing with a dry fly but considered that hanging a midge underneath would probably be a good idea. The 9' 4 weight Sage Accel seemed appropriate for the task, and I was soon rigged and ready. Days on the water are as much time for research and development as they are times for pure fishing fun. Such is the life of a guide and one I wouldn't want to trade with anyone. For this particular day, the midge of choice was a new color combination on an old classic, the Zebra Midge. 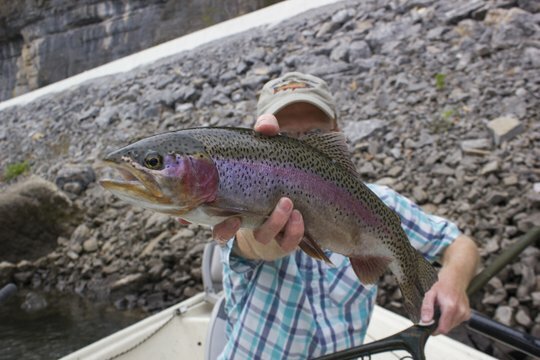 The previous day had seen a 20" holdover rainbow fall to this new color scheme on a guided float trip, so I was looking to see if that had been a fluke or if I was on to something good. Once I got in the water, I had to rub my eyes to see if I was dreaming: there were no other anglers and no boats passing by. In other words, I had the river to myself. That wouldn't last long, but the four boats that went by hardly constituted a crowd, and three were rowed by friends of mine. Seeing friends on the river is about as pleasant an interaction as one will find anywhere and thus these encounters enhanced an already good day. In between getting distracted, I was catching trout. Lots and lots of trout. 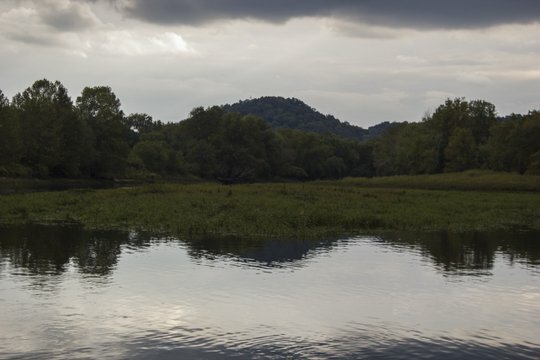 There are times when I think that cloudy days are very difficult on the Caney Fork, but this was definitely not one of them. Fish after fish fell for my midge pattern. 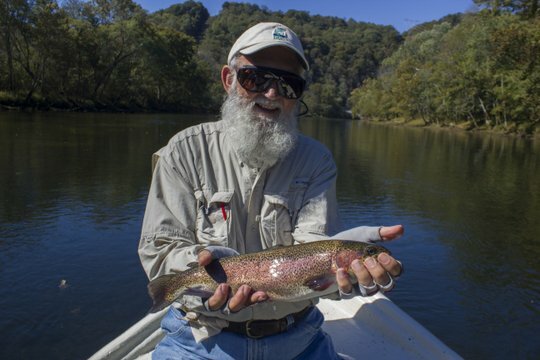 The true monsters eluded me on this trip, but every fish I caught was healthy and sporting some of the best colors you will find on a trout anywhere. I put a couple of the fish in the net so I could get some pictures without risking harm to the trout. The colors were so vivid that, with each successive fish, I thought that perhaps I had just caught the prettiest trout of the year. Eventually I realized the utter futility of comparing one fish with another. 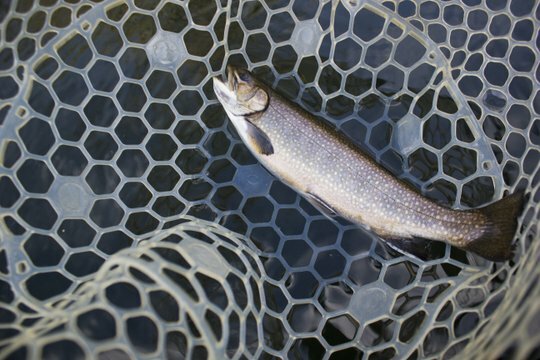 Each trout is a blessing to be treasured and enjoyed for a brief moment of connection before releasing them back to grow some more. 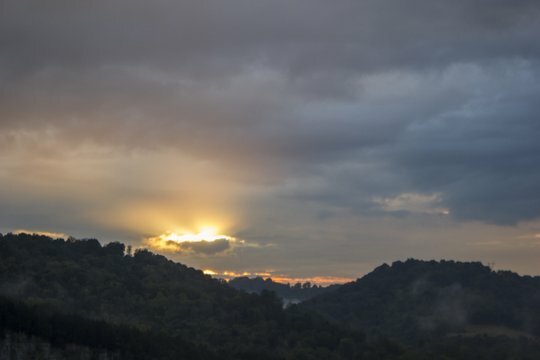 A couple of times I turned around and eventually noticed the clouds lowering and growing darker. Shortly after taking this picture, I thought that perhaps it might be a good idea to head back to the car and prepare for rain. On my way up, I looked around again and realized that I wasn't alone after all. 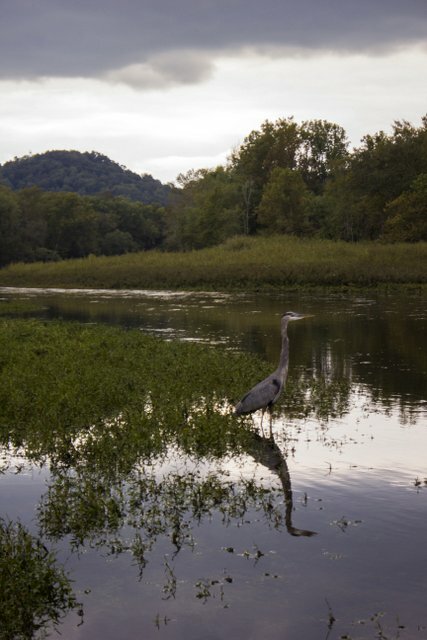 I had a great blue heron for company on this day. Back near the car, I raced the last few yards as the rain began in earnest. Thankfully my raincoat was easy to grab out of the trunk as I debated whether to continue my day or just call it now. 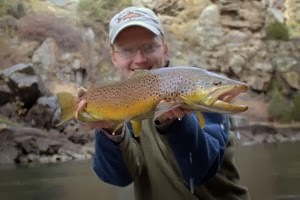 The thought of fired up brown trout won out, and I grabbed a 5 weight and quickly rigged up for streamer fishing. Heading back down to the river, I wondered whether I was crazy but never stopped moving long enough to get serious about it. On literally my first cast, a fish blew up on the streamer, so I knew the possibilities were there. Working slowly downstream, I covered water carefully. Eventually I had gone about as far as I wanted to go and was ready to reel in and move back up when I had the thought to take one more cast. 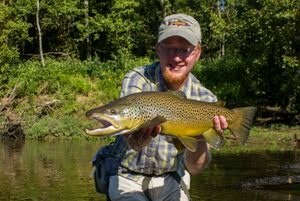 Sure enough, a fired up brown pounded the fly. Somehow this good day really was able to get better. Anyone who knows me knows how much I enjoy fishing streamers and this really was the perfect end to a perfect day. By this point I had some renewed enthusiasm, so I carefully fished the streamer back upstream and caught one or two more fish before reaching my path out. Some days just happen to work out perfectly, but those are rare indeed. 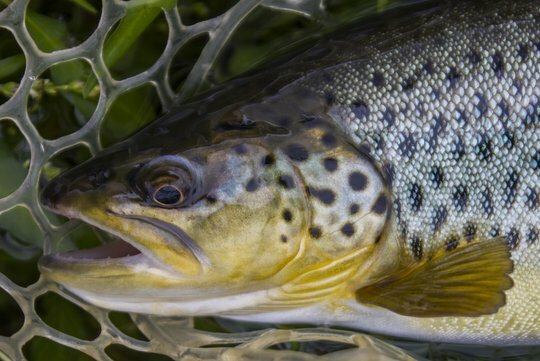 My definition involves more solitude and fewer trout than most anglers, but then I've come to realize that catching is only a small part of the equation for me at this point. Finding solitude on such a popular and amazing river is rare indeed. Most likely the next time I find solitude will be in the dead of winter when I'm the only idiot crazy enough to be out fishing. And out fishing you will find me, looking for yet another perfect day in solitude.